New Year’s is just around the corner, actually RIGHT in front of our doors! Here are some really fun free New Year’s Eve printables. Great for a get together with friends and family to celebrate the new year. This list of free New Year’s eve party printables provides just about everything you need to host a fabulous New Year’s eve party at home. I am all for an elegant party setting. Let the kids join in with some games and have fun taking lots of memorable photos! Play a best and worst moments card game with your family and friends. This game will sure be a hit and hilarious! Download these adorable kids New Year’s Eve party hats! Plus, this site has 9 more great New Year’s Eve activities for kids. With these stylish and kid friendly New Year’s bash printables, you will be fully equipped to decorate with banners (with all numbers so you can use them every year!). Further you’ll get cup wrappers, a clock worksheet and bubble gum contest meter. Print out some beautiful sparkling 8 x 10 printable plus bottle labels and gift tags. These are just amazing in gold, white and gray. This New Year’s Eve party favors printable is perfect to add a special touch for the party. I love the silver and gold kisses they used! 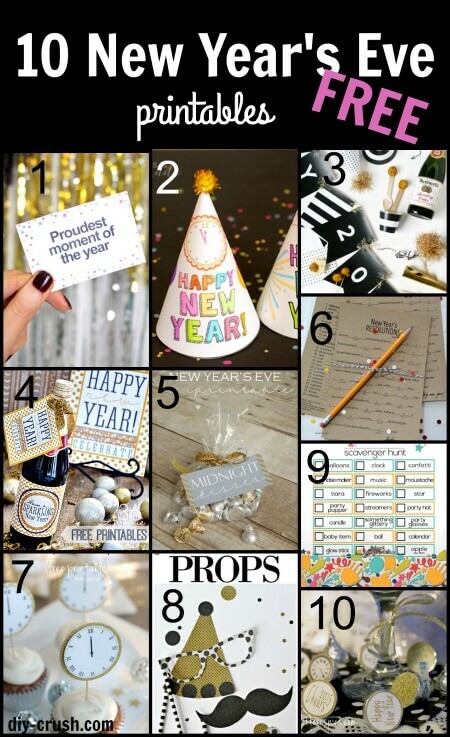 Play a New Year’s Eve resolution game with printables to get your priorities straight right there at the party! LOL….Looks like a super fun game! Decorate cupcakes with these cute midnight clock printable. I can see those used on a banner as well! Or how about some fun New Year’s Eve photo booth printables? Those are definitely great for adults and kids. This New Year’s eve scavenger hunt game is meant for kids but I’d totally play along! Sounds fun! Add these printable New Year’s eve stickers to the bottom of Hershey kisses. Every guest will love these!